I had some free time at my theater, waiting for “Captain Marvel” to be screened last night. So I bought a ticket for–and saw–“The Lego Movie 2: The Second Part.” (It was OK, but the thrill was clearly gone.) I, um, somehow got lost getting back to the lobby, so I watched the climax of “Fighting With My Family” (amazing how the U.K.’s working-class whites are portrayed in films as being just like Black people in the ‘Hood! ), and then, continuing my lost journey, watched “What” from the beginning. Um….why did, for the entire time, Henson remind me of Luther’s almost-but-not-quite crossover songs? She wants white people to like her REAL BAD. She tries to keep her “edge,” but she also wants their comfort level kept. A movie that could–and maybe should–have had serious edges copped out. And it’s clearly hard to write rom-coms: not because of the rigid format, but the fact that you have to be funny enough to make the audience forget it. This failed. I was bombarded with Black images today, both subtle and powerful. Did a double-feature this afternoon—“Hidden Figures” and “Fences.” The former, part of a new trend of “Black History Month Movies” (I am old enough to remember when these kinds of films were only on HBO) made me choke up, while the latter had me in that August Wilson hypnotic state, where his never-ending flow of working-class words arraigned in profound ways continue to fill the mind until you can’t take any more. “Hidden Figures” did a good job turning a not-so-routine job transfer from a smaller office into a bigger one into a Civil Rights march. It was a very patriotic movie; I guess it helps greatly if your movie on Black excellence is also about John Glenn and NASA. So this is the Henson Black moviegoers have known about for two decades and white people have not been able to stop talking about for the past two years! For the first time, really, I was attracted to her, and yes, it had everything to do with those glasses and the idea that this film was the closest Black America ever had to having its own version of “A Beautiful Mind” without the mental illness. She and her co-sisters displayed with great power their controlled rage of a unprivileged class. I was interested in how much that film was about their discrimination being gender-based. I kept wondering if that emphasis was part of the story, or was it Hollywood’s way of making everyone (reading: white) comfortable. Comfort and humor were sprinkled throughout this film, and both work. As for “Fences,” I have only wanted to see this play for 30 years; I am quite grateful for this movietelling. I couldn’t stop thinking as Denzel did his best, How did James Earl Jones did it? I bet he sounded louder, angrier. Viola Davis to me is that Black actress who nails down the “Black woman holler” thing, but she is a rainbow of feeling. Denzel had real challenges, the biggest one being making this play—where the camera almost never leaves the house and backyard—as a movie, a moving picture. He keeps the camera on the words, and hopes that you feel enough to compensate for the lack of visual narrative. What is great about 2017 is that the dam holding back all of the positive images seems to be more cracked than ever. Yes, only the acceptable images are out. No, the more radical parts of the African-American experience are nowhere to be seen. No, we can’t have one of these “Black History Month” movies without a major white actor headlining (the camera seems to find Kevin Costner whenever it can, like it did when Indiana Jones was in the Jackie Robinson flick). 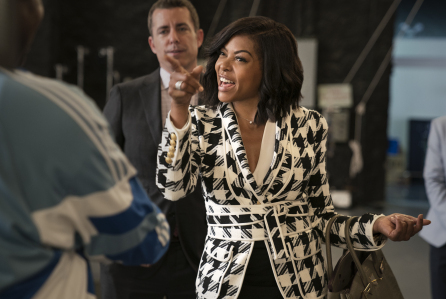 But I must admit it was an absolute joy to be able to finally watch Taraji Penda Henson, Viola Davis (who now needs no more, ah, “Help” to get some more statues 🙂 ) and Octavia Spencer without having to flinch. And Janelle Monáe owns the screen like she’s been acting her whole life. More, please. And I hope Denzel follows through on his goal of producing the remaining un-filmed plays of the Black American Shakespeare (yep, I said it!). 10:59 P.M. EST UPDATE: Congrats to Viola Davis!